The village of Farkasgyepű has approx. 400 inhabitants and is located in the county of Veszprém only 7km from Városlőd . The settlement’s Hungarian name is a combination of “farkas” (wolf) and “gyepü” (protective barrier) and points to the once great population wolves in the area. When the wolves disappeared at the beginning of the 18th century, a safe “royal road” was built through the village. Furthermore, the region used to be a popular hunting ground as early as the 15th century under King Matthias. Thus, the diocese opened a roadside tavern. Deriving from that, the village has been called different names such as Csárda (tavern), Korcsmácska (little tavern), Koplaló (starving) – and the name Wirtshäusl (little tavern), which was coined by the German population. Up until today, the area has maintained its multilingualism. Presumably, there has never been a formal contract for settlement between the first German inhabitants and the Vestprém diocese. Since there was a glass factory in the neighbouring village from 1753 onwards, the first settlers had been workers doing glassworks in the area. In 1756, Michael Kostajger established a new glass factory in the woods nearby. Many of Farkasgyepű’s inhabitants were workers from that factory. 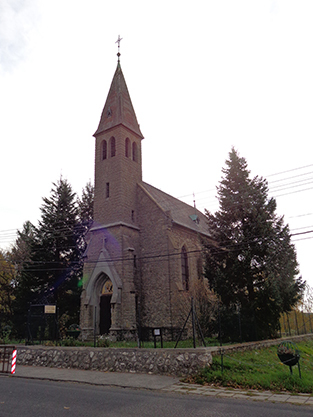 The diocese itself only targeted settlement of Germans in the area at the beginning of the 19th century and the forestry in the surrounding woods brought many people to the village. Due to the work options in the area the number of residents increased quickly so that the settlement became independent in 1863 and built its own school in 1872. In 1880, the village had 305 inhabitants and reached its limit of capacity in terms of space and opportunities of work and a wave of migration followed. Since the cultivation of grain was not possible in the area, the diocese cleared a part of the woods for the people of Farkasgyepű. Thereby, they wanted to create new possibilities of living and prevent further migration. At the 1941 cencus, 56% of inhabitants answered German when asked about their mother tongue. On January 20 1948, 110 German residents – 23 families and two individuals – were displaced. Five families were allowed to stay. Farkasgyepű is known for the beauty of its forests and the healing power of its air. Already in the early 20th century, a forest-based school was established for children with breathing difficulties. This school later developed into the famous sanatorium for lung diseases, which treated adults as well. Until today, people with respiratory problems come to Farkasgyepű from all over the country. The Roman Catholic church “Visitation of Mary” is worth visiting. The Bishop of Vestprém Károly Hornig had it built and it was consecrated in 1909. 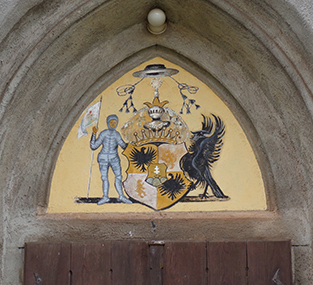 His seal can be seen over the entrance. Roman Catholic church, built in 1909. Seal of the Bishop of Vestprém over the entrance. 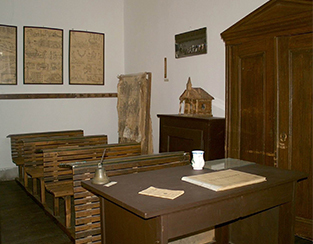 The museum exhibits the history of the village and the first village school.